Ballina.info advises all visitors to be aware of surf safety rules and follow the recommendations of the Australian Surf Life Saving Association. Beaches patrolled by lifeguards: Weekends, Christmas & Easter holidays Shelley Beach and Lennox Head Surf Life Saving Clubs have lifeguards patrolling the beach. Contact the local Surf Life Saving Organisation 6686 4163 for more info. Always swim or surf at places patrolled by surf lifesavers or lifeguards. Swim between the red and yellow flags. They mark the safest area to swim. Always swim under supervision or with a friend. Don't swim under the influence of drugs or alcohol. If you are unsure of surf conditions, ask a lifesaver or lifeguard. Never run and dive in the water. Even if you have checked before, conditions can change. If you get into trouble in the water, don't panic. Raise your arm for help, float and wait for assistance. Float with a current or undertow. Stay calm. Don't try to swim against it. Signal for help and wait for assistance. If you are a weak or tired swimmer, float with the current, don't fight it. Swim parallel to the shore for about 30 - 40m until you reach the breaking wave zone, then swim back to shore or signal for help. Stick to yoIf a broken wave approaches when the water is not too deep, dive down and run or crawl along the bottom. In deep water, do not use extra energy trying to reach the bottom; instead duckdive to just below the turbulence. Wait for the wash to pass and then push or kick to the surface (off the bottom, if possible). 1. As the wave is almost upon you, push off the bottom or start swimming toward shore until you feel the wave begin to lift and carry you. 2. As the wave breaks, take a breath, put your head down and kick hard until your body breaks through. Your feet should be together, your back arched slightly and your arms extended in front of you. As the wave becomes steeper, tilt forward and surf along the wave's face. 3. You will probably have to paddle a bit to hold your position on the wave. Try to keep your body straight. 4. As you approach the beach, pull out of the wave by turning your body away from the wave's breaking force, or jackknife dive and let the wave pass over your body. 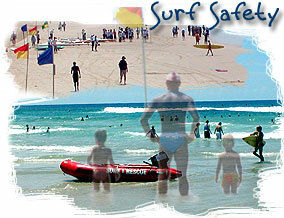 For more information about surf safety visit the Surf Life Saving Australia site.